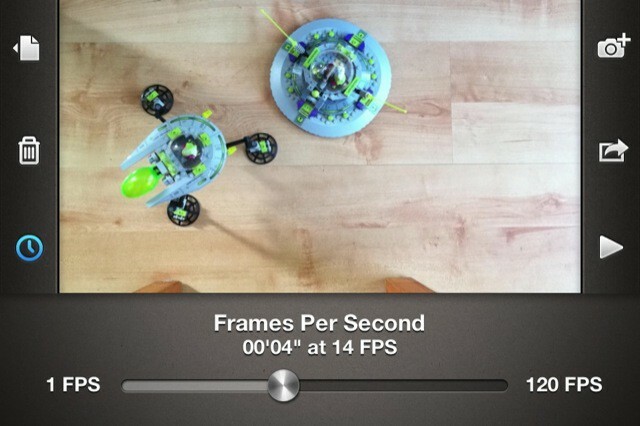 Frameographer is an excellent $3 photography app for stop motion and time lapse video recording. It works because it keeps things as simple as they can possibly be. One thing I like about it is that it’s been made with the frustrations of time lapse and stop motion recording in mind. 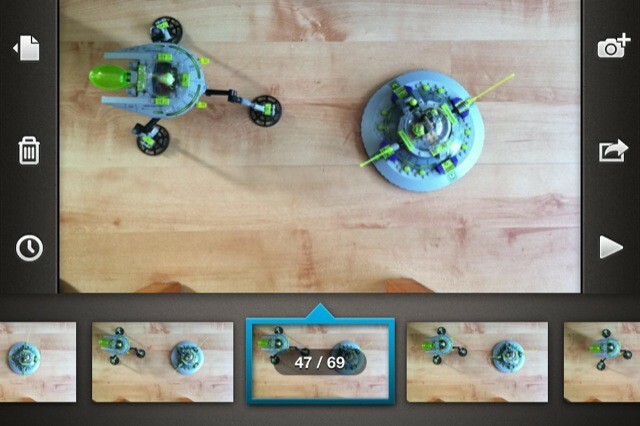 Those of you who’ve tried it will know that shooting time lapse or stop motion takes forever. Just a few seconds of footage requires hours of painstaking work. Consequently, it’s likely that your animated epic will be recorded over many separate sessions. Frames understands that, and makes it easy to stop work on a project and return to it another day. There’s also plenty of scope for error when making things like this. Manipulating models in time lapse mode means you’re quite likely to have frames where your fingers creep into shot unintentionally. Frameographer lets you review your work shot-by-shot, find the errors, and delete them without fuss. This is why it succeeds: it anticipates the problems you’re likely to encounter, and provides really simple solutions to them up front. But it’s so simple to use, there’s no need for instructions. Everything’s clear from the start, or discoverable with a tap or two. Another thing I like about Frameographer is that it isn’t yet another social network. Thank goodness for that. It’s a tool for making things, nothing more. You don’t have to sign up to start using it, there’s no need to upload your address book or connect to Twitbook or follow anyone or fave anything. You just open up the app and start being creative. When you’re done, export your movie to the Camera Roll – if sharing via social networks matters to you, you can do so from there. Frameographer sets out to turn a difficult time-consuming task into a very, very simple time-consuming task, and it does so extremely well. It strives for simplicity and hits the spot. There’s nothing in this app that isn’t necessary and useful. Coming from the same team that brought you The Glif, perhaps that shouldn’t be such a surprise. Frameographer is an excellent app that sets out to do one job with style. Con: I can’t think of one.